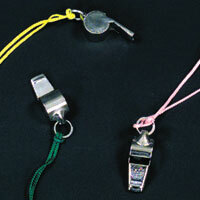 2 inch metal whistle on 30 inch neon colored cords. $6.50 per dozen for 25 dozen or more. $5.70 per dozen for 50 dozen or more.